Easter in Germany is a big deal. We get four whole days off. Yes, that means another two days, Friday and Monday, of holiday-ish (over)eating. But I will be honest- today, with no invitations to Easter Monday brunches, egg hunts or other pressing culinary agenda, I decided to take it light after yesterdays feast, which included, among other things, a superb eggplant parmigiana made by my friend Emanuele. I promise I will devote an entire post in the very near future to this melt-in-your mouth Italian dish. Even after an hour or so walking along the canal after our lunch, I retreated home and, in an immense food coma, crawled straight into bed for the night. Ten (yes ten) hours later I awoke, but still with little desire to eat like it was another holiday. 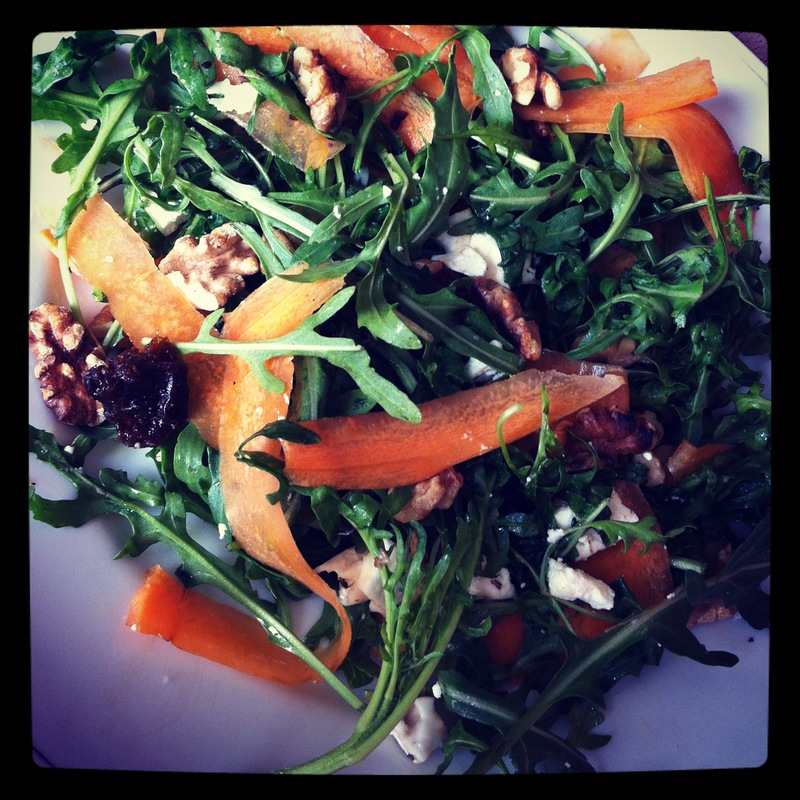 As we start to edge into spring and summer, you will find how fond I am of salads of all kinds. I consider them the perfect palate on which to mix textures, flavors or just about any ingredient that’s fresh and seasonal. The possibilities are simply endless and I pride myself with having invented some pretty good ones. So today, a quick and easy salad was definitely in order, of the kind that just requires a bit of deep digging in the pantry or vegetable drawer. 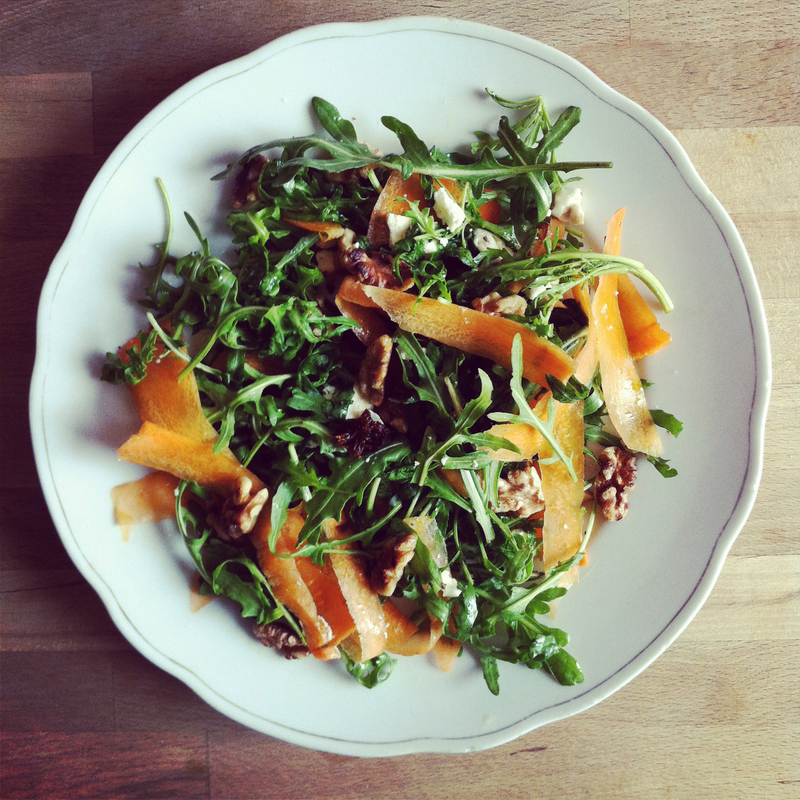 Arugula- a base that never fails. Just arugula would have been fine. How about some of that chèvre with herbs de Provence I bought the other day? Sure. Something else vegetal- a shaved carrot, yes. Now, some crunch. Deep in the pantry I found some walnuts, which, quickly dry roasted, are always the perfect crunch. One last addition for a touch of sweet was two chopped dried plums (Pflaumen? actually, maybe prunes…) A simple dressing of a drop of maple syrup with olive oil, a squeeze of lemon, salt and pepper rounded out this fresh, pretty healthy salad. And so goes Easter Monday. But don’t forget a chocolate marzipan egg for dessert.